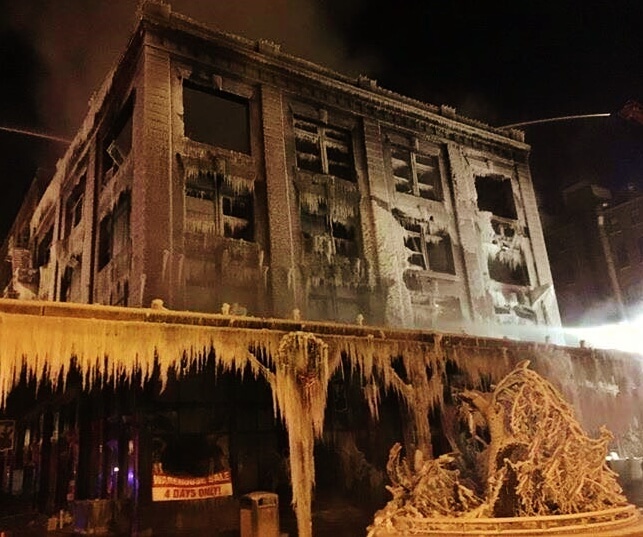 Ice scabs over the charred remains of M’s Pub Sunday morning, serving as a beautiful and terrifying tribute to the decades of tradition The Old Market lost in Saturday’s fire. With the blaze finally contained, we know that the basement of M’s partially collapsed late afternoon Saturday, while the apartment and restaurant ceilings collapsed in the very early hours of Sunday morning. While everyone was safely evacuated, and injuries incurred were not life threatening, the temperatures remain a threat to firefighters still attending the scene. With the extent of the damage days away from being accurately assessed, the community wasted no time coming together in support of those who lost their jobs and homes last night. Restaurant owner Greg Cutchall has extended an offer to employ as many of M’s staff as he can at nearby Jams while M’s owners Ron Samuelson and Ann Mellen decide where to go from here. The Red Cross leapt into action, finding lodging for displaced families at The Residence Inn at 106 s 15th st. Donations can be made by simply texting 90999 to automatically send $10 to the cause. The Reader will continue to update you on the efforts, as well as how you can help as information becomes available.